Goal Tree: is it worth it? Depending the methodology, building a Goal Tree requires some time and attention from top management. The one I am thinking of is typically a two to two and half day seminar (when led by an expert). Therefore the Chiefs often hesitate to invest this time as they are already overbooked and question the necessity of the exercise: is it really worth it? 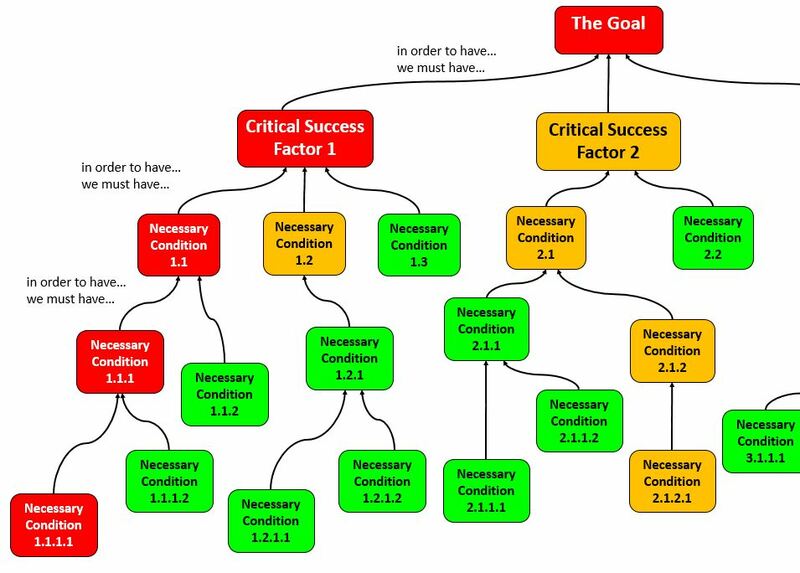 It is worth to invest the necessary time to re (state), refine of review the Goal, define the Critical Success Factors (CSFs) to achieve the Goal and at least the first layers of Necessary Conditions (NCs), to achieve the CSFs. It is worth because such a Goal Tree remains valid even if top managers leave, because it is tied to business fundamentals and not to someone’s “strategy”. Much of what a Goal Tree describes will remain valid, even if people in charge change. Yes it is worth to invest time to set the benchmarks (CSFs and NCs), as they will remain valid over a period of time, because they are business fundamentals. World expert and father of the Goal Tree Bill Dettmer uses to say “Goal Tree well built remains valid until the business environment changes or the way the organization is doing business changes significantly“. Furthermore, compared to actual performance, these benchmarks will help to define the roadmap for improvements. With these elements, the subordinates will know onto what to align their improvement efforts and get tangible and measurable ROI instead of sprinkling “improvements” here and there with sole measurable parameter being the cost of efforts spent. Yes it is worth the C-suite invest some of its time to provide subordinates a sound vision, a clear Goal and direction about how everyone in the organization can contribute achieving the Goal. It is especially worth when compared with the time spent in useless meetings and daily firefighting. Firefighting makes feel important and active, but in reality it is more gesticulation than action. Aligning people’s daily efforts on meaningful targets will solve some problems and reduce the need for firefighting. Alas, many world-saving managers don’t like this kind of wise and humble posture. This is good for old men meditating atop remote mountains, not for business warriors they think they are. Yes it is worth to invest some time to get a visual management tool to assess progress towards the organization’s Goal, foster, sponsor, realign and refuel improvement programs. It is worth if after building a Goal Tree, the Chiefs use it for periodical review and self assessment.